United States, the repetition of a lie. The Interests Section of Cuba in Washington was again forced to suspend its consular services in the U.S., unable to find a bank in this country that is safe to assume the bank accounts of the Cuban diplomatic missions. Following this line of action, the U.S. government led by Barack Obama, has refo rzado sanctions of all banks in the world to make financial transactions Cuba and since his arrival in the White House have been imposed higher penalties for more than half a century of Economic Warfare. The Zurich Cantonal Bank, Banco Credit Suisse Ag, fined 536 million usd, Lloyds Bank in London, fined 80 million usd, Intesa San Paolo Bank of Italy, fined 3 million usd and the Swiss Bank UBS fined 140 million usd. The reason for these fines and deliberate pressure from the United States is to overthrow the Cuban Revolution, as is reflected in Operation Mongoose and design of Economic Warfare, so no banks decided that running risks. That’s the real reason why the M & T Bank Corporation, announced last November, terminate its services to diplomatic missions of Cuba. 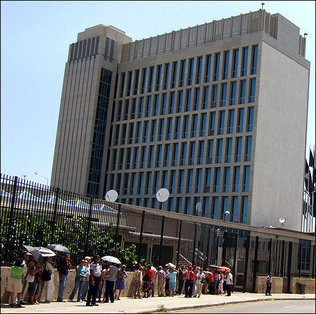 After the diplomatic mission announced the suspension consular services not find a bank with which to operate, the Yankee government expressed “disappointed” by the decision of Cuba, and that he had “helped” to identify a viable solution. Lying and misrepresentation of reality is always used by the U.S. government. What help can provide the United States if he has done for half a century is punishing everyone who trades with Cuba? At the UN Cuba is supported for almost 20 years, to condemn the United States for the Economic and Financial Lock, Commercial, and almost all countries only votes against the United States and its ally Israel, but they do ignore and keep trying to reach the goal they aspire for 53 years, which is to overthrow the Revolution. However, by decision of the current Obama administration, banks in the U.S. can now receive money from businesses that sell marijuana covered by state laws. The rules released by the Justice Department and Treasury Department say it’s a victory for these businesses, which were previously excluded from the services offered by banks due to the nature of the product they sell. That’s the double standard of the Empire, while trying to kill an entire people, supports the drug trade and financial transactions with money derived from sales, which further stimulate business this criminal lacerating many lives of young Americans. That’s why the world sees America increasingly mud.